PRI’s This American Life is making a big push into movies with the opening of the new independent film Sleepwalk With Me Aug. 24 in New York, but producer and co-writer Ira Glass doesn’t know whether public radio audiences will want to sleepwalk with him. Based on co-writer, director and star Mike Birbiglia’s hit one-man show, which was previously adapted into a 2008 TAL segment, the film follows Birbiglia’s real-life journey as a burgeoning stand-up comic suffering from a sleepwalking disorder and doubting whether he should stay with his long-term girlfriend. The movie won the audience award for first-time filmmakers at this year’s Sundance Film Festival. It’s off to a good start. Distributor IFC initially booked the film for 35 theaters nationwide, but demand (spurred by Glass himself, who took to TAL’s website to implore listeners to call theaters) has caused that number to spike to 125. TAL employed its fans in other ways, too. It solicited audiences for test screenings in fall 2011 through cryptic notices on its Facebook page, and upwards of 80 people showed up for each one. Though Sleepwalk is only the second completed film wholly based on a TAL property (after the 2006 studio family comedy Unaccompanied Minors), Glass and his show have been active in the movie industry for years. After learning that Hollywood studio executives were pitching films based on stories they had heard on the program, the show hired a full-time staff member to handle movie projects and entered exclusive rights agreements with studios — first Warner Brothers in 2002, then DreamWorks and Paramount Pictures in 2006. “We were making money from the idea that movies from our show would get made,” Glass said, adding that the program has turned a small profit on film projects, even the ones that don’t get made. The exclusive agreements stopped in 2008 as big studios began phasing out low- and mid-budget films in favor of more tent-pole blockbusters, which left the sorts of stories TAL features out of the picture, Glass said. That includes Sleepwalk. Without a big star — “Mike Birbiglia means nothing overseas,” Glass joked — the film required independent financing. After approval from the board of parent station WBEZ in Chicago, TAL contributed a quarter of the movie’s million-dollar budget out of a fundraising surplus the show had earned in fiscal 2011 from underwriting, mobile-app profits and listener donations. “We really did have extra money, and so we thought, ‘OK, let’s take a risk,’” Glass said. The film took three years to make from the time screenwriting began, but Glass said Sleepwalk never hindered TAL’s production schedule. Things appear to be moving faster for TAL in Hollywood these days: Oscar-winning director Errol Morris is set to helm a feature, Freezing People Is Easy, starring Paul Rudd and Kristen Wiig and based on an episode about cryonics. And as if to provide further evidence of public radio’s influence, Sleepwalk also became the subject of a tongue-in-cheek “boycott” campaign led by Joss Whedon, director of the mega-blockbuster The Avengers, who winkingly announced Aug. 14 via YouTube that he intends to crush the film for posing a threat to his bottom line. Way back in 2003, Current examined TAL’s partnership with Warner Brothers and the multitude of film projects in development at the time. As is often the case in the movie industry, very little became of most of the planned endeavors, though Unaccompanied Minors eventually saw fruition. 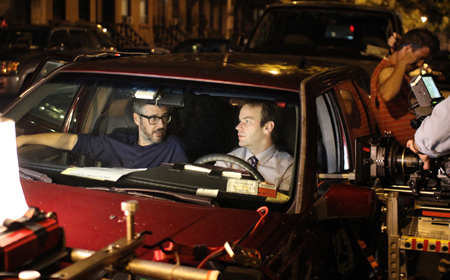 Though Sleepwalk is Birbiglia’s first feature-length film behind the camera, he’s also directed and co-starred with WHYY’s Fresh Air host Terry Gross in the short film Fresh Air 2: 2 Fresh 2 Furious (which Glass also produced), shown to audiences as part of the TAL live broadcast in May. The film, a look at what happens when a Fresh Air interviewee won’t leave Gross alone, gives Gross the opportunity to display some heretofore unseen comedic chops. The late French Chef Julia Child is getting a burst of extra attention with the Aug. 7 release of Julie & Julia starring Meryl Streep as pubTV’s breakthrough, endearingly unpretentioius cooking teacher. I’m on the board of directors for a local art cinema, and can tell you that Ira’s campaign has really annoyed the manager. Turns out that theater owners don’t like this tactic any more than public broadcasting programmers do.